A couple of weeks ago, we mentioned earlier that the mass production of Samsung Galaxy M10 and M20 has kicked off in India and will be official in 2019. Samsung is willing to take over the budget and mid-range segment smartphone market in India with its new M series devices. The Samsung Galaxy On and Galaxy J & C series phones can’t stand out individually in this market competition properly. While all other respective brands smartphones performing quite well in the budget and mid-range smartphone category. The new report surfaced online that Samsung has started the mass production of Samsung Galaxy M10 and M20 series devices in India. 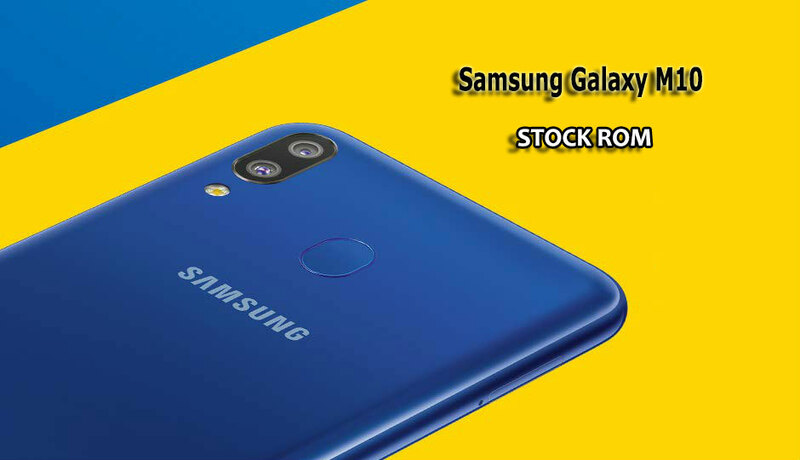 In this post, we will talk about the Samsung Galaxy M10 Stock ROM download and installation steps. Talking about the Samsung Galaxy M10 and M20 series smartphones, the rumored unofficial M10 and M20 could come with the model number of SM-M105F and SM-M205F respectively. According to the leaked Geekbench benchmark test result, the Samsung Galaxy M10 will come with Samsung’s Exynos 7870 octa-core chipset. It could be packed with a 3GB/4GB RAM and 16GB/32GB internal storage. While the Galaxy M20 device could come with Exynos 7885 SoC coupled with 3GB/4GB RAM and 32GB/64GB onboard storage capacity. Meanwhile, the AnTuTu result showing that the phone might appear with HD+ resolution, a 19.5:9 aspect ratio. Till then, we have to wait for more information and leaks about the M series. The Galaxy M10 model will get regular OTA updates in the future but currently, you can simply download and install the Samsung Galaxy M10 Stock ROM manually. The Samsung Galaxy M10 model number is SM-M105F as mentioned above. The stock firmware is based on Android 8.1 Oreo out-of-the-box right now and comes with a software version of M105FDDU1ASA5. You can easily download the Galaxy M10 firmware file from here. Disclaimer! Make sure that the stock firmware installation will erase all of your device data. So, back up your device system and data completely before doing anything. thedroidguru.com won’t be responsible for any kind damage or issue occurs to your Samsung device. Make sure your device has more than 50% of battery charge. Download Samsung USB Drivers On Windows or Mac (Important). Download latest ODIN Flash Tool (Windows and Mac). Now download the Samsung Galaxy M10 stock ROM from the link already given above. First, Download the Galaxy Firmware according to your device’s model number. If already downloaded then skip this line. After downloading the ROM file, if it’s in a (.zip) format then simply extract it on your PC/Laptop. You will get (.tar) or (.tar.md5) file. Download from the above link and Unzip the latest Odin Flash Tool zip file or the latest version (if any). Now run/open the Odin.exe file from the extracted files on your PC. Now Boot your Samsung Galaxy device into Download Mode (Switch off your device then press Volume Down + Power + Home button simultaneously). Then press Volume Up button to continue to Download Mode. Now simply connect the phone to your PC via USB cable and the ODIN would notify a message. Choose Android Partition or System Partition in Odin Flash Tool and select the firmware file which you have downloaded earlier (in .tar.md5 format). Now Click on the ‘Start’ button below to start the flashing process. It will take some time so please be patient for at least 10-15 minutes normally. Once the flashing process completed, your phone will reboot automatically to the new system. Now your device should run on the Stock Firmware. For a detailed guide, head over to the link for complete steps of flashing Samsung stock ROM using Odin.